The luxury Italian fashion house has reportedly teamed up with South Korean beauty brand Tonymoly on a makeup collaboration. The Instagram blogger Trendmood claims to have the scoop -- as reported by Allure -- taking to the social media platform to share images of a vibrant collection spanning products for eyes, lips and face. Highlights include a facial cream dubbed the ‘Floria Nutra Energy 100 Hours Cream', two ‘Super Beam Eye Palettes' designed to look like phone cases, and three different editions of a ‘Chic Stay Tint' liquid lip colour. The entire range appears to be packaged in black and gold casing adorned with colourful motifs, channeling the fashion label's signature playful aesthetic. 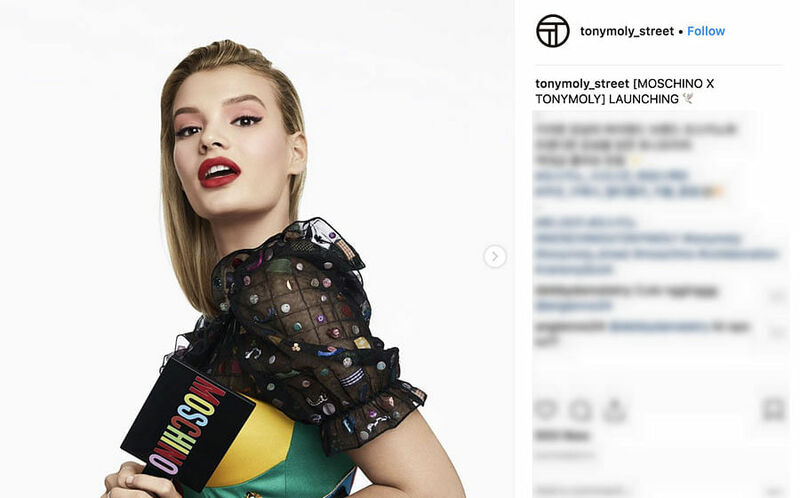 Tonymoly appeared to confirm the launch of the collaboration earlier this month, also sharing images of the series with its 223,000 Instagram followers. However, there is no word yet as to when -- or if -- the collection will launch. Tonymoly is not the first big beauty collaboration for Moschino -- the label has previously teamed up with the retail giant Sephora on a makeup series, and its creative director Jeremy Scott designed a retro-themed cosmetics line with MAC earlier this year.